The Romney campaign has harvested the celebrity power of yet another another high-ranking politico, adding to its arsenal of Mitt-favoring parody Twitter accounts none other than beloved democrat Bill Clinton. 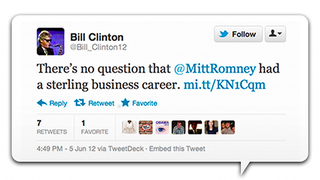 The parody Clinton account has only 11 tweets, at this writing—the later ones increasingly hokey, beginning "Ruh roh!" and "Oopsies!" and "I'm back, baby!!"